What Is YouTube TV, and Can It Replace Your Cable Subscription? It seem like everyone is jumping on the streaming live TV train these days, and with Google getting YouTube on board, it’s worth a closer look. 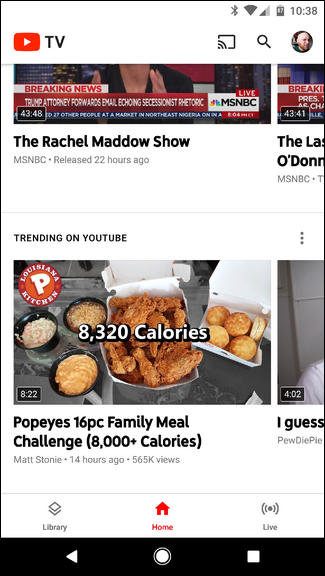 While there are things to like about YouTube TV, I feel like Google still has a lot of work to do to make this a legitimate option for everyone. In a nutshell, YouTube TV is Google’s take on streaming television—much like Sling, PlayStation Vue, DirecTV Now, and the like. It’s an all-inclusive $35 package that brings a handful of channels you may or may not want to watch…but that doesn’t really matter, because you don’t get to pick and choose (for the most part, anyway). It features both live TV viewing and a DVR service. Note: At the time of writing, YouTube TV is only available in parts of the U.S. Head here for a full list of coverage areas. Where most of the competitors offer specific packages that you can choose based on your needs, YouTube TV is an all or nothing sort of deal, which I guess is fine if you don’t really want more or less than it offers. It offers 48 channels out of the gate, and add-ons for ShowTime ($11/mo) and Fox Soccer Plus ($15/mo) if you’re so inclined. As you can see, there are some decent channels in the lineup, like AMC (Walking Dead!) 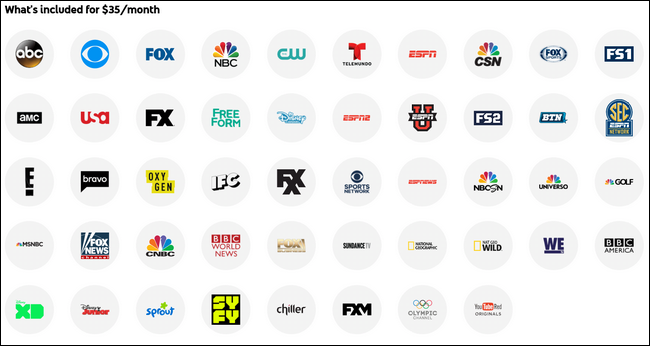 and FX, along with several versions of ESPN, NBC Sports, and the like for those who like to keep up with sports. It even includes Sprout, Disney Junior, and Disney XD for the kiddos. So yeah, there are some good channels here, but of course that also depends on your viewing preferences. And that’s really where YouTube TV starts to fall short: this is what you get. Like I said, you can add ShowTime and Fox Soccer Plus if you want, but that’s it. There’s no option for HBO, no sports-specific packages (with NBA TV, MLB TV, etc. ), or anything else for that matter. Not only that, but not all channels are available in all areas just yet. For example, ABC isn’t available for live streaming in Dallas—you can only watch on demand content. But hey, you get YouTube Red Originals, so that’s something…right? 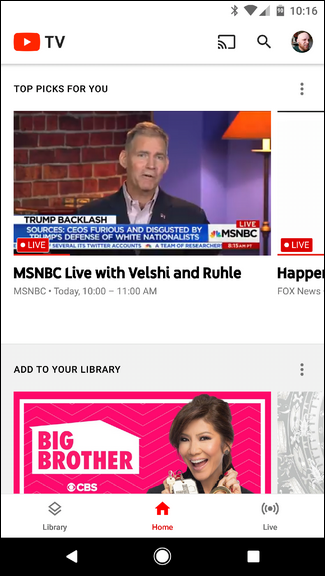 There are a couple of ways to access YouTube TV: through the web and mobile apps. It’s available for both iOS and Android, and they share a common interface between the two. You can add up to six Google accounts to your YouTube TV service when you sign up, effectively giving everyone in your family their own YouTube TV. The one thing that baffles me about YouTube TV is that it’s not available on any set-top boxes, like Roku or Apple TV. 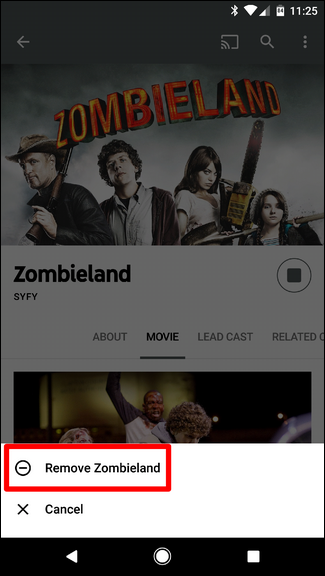 It’s not even available for Google’s own TV platform, Android TV. Instead, the only way to watch it on a TV is to Chromecast or AirPlay it from your phone. What kind of mess is that, Google? I can only hope that maybe they’ll release some set-top box apps once YouTube TV is available in more locations. But it’s very strange that it doesn’t exist right now, not even on Google’s own TV platform. While the mobile and web interfaces are different, If I had to pick one feature that just kills YouTube TV for me, it’s the web interface. 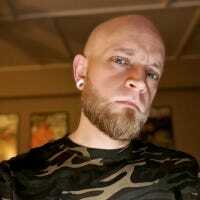 It’s just bad. As soon as you fire it up, you’re bombarded with several live previews. It’s a little bit overwhelming, honestly. Every single one of those previews is live. They move. The app does the same thing, but on a smaller screen it’s not as bad—you can only see one or two previews at a time, thankfully. 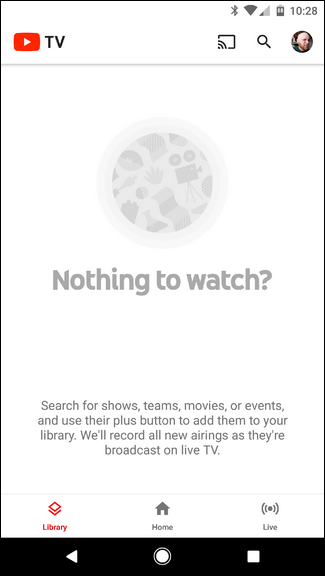 Library: This is where your “recorded” shows are listed. 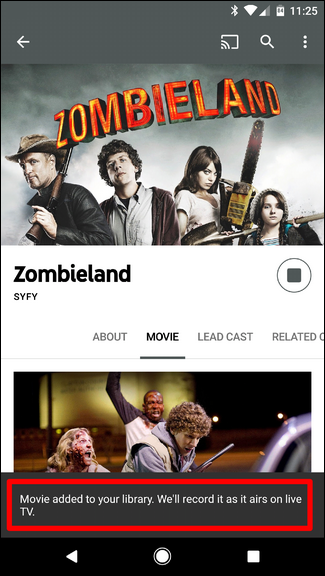 Home: The main interface, with suggestions and popular shows. It’s a mess. Live: This is basically the guide, and it honestly it should be the first thing you see. Speaking of the DVR service, it’s actually pretty solid. Each live show or suggestion has a little plus sign near the title—pressing this will set the show to record all future episodes. It’s almost like that’s how DVR works, right? 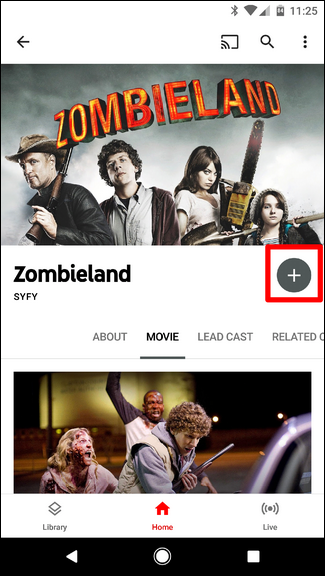 The Home screen is where you’ll find suggestions and whatnot: top picks popular TV, movie suggestions, news, latest shows, and things like that—but it also throws YouTube content into the mix. 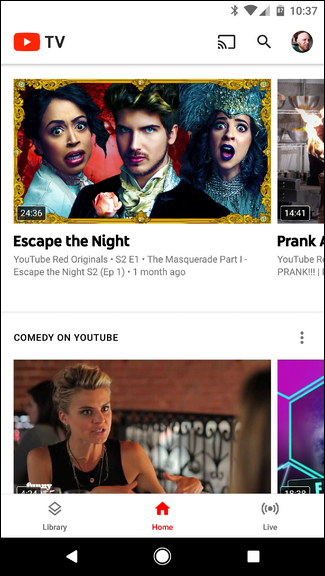 On one hand, it makes sense, because this is YouTube TV after all; on the other, however, I find a huge disconnect between YouTube content and TV content. Maybe I’m just old and don’t get it, but to me YouTube doesn’t feel like TV. It feels like a bit of a mishmash. While I find the Home screen a convoluted mess, I do appreciate the ease of use here—three sections to choose from keeps it simple. And if you ignore everything that’s actually happening on the home screen and look at the sections, it’s not terrible. Honestly? 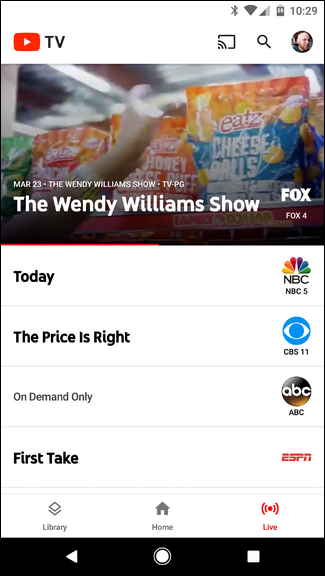 The biggest downside of YouTube TV right now is lack of choices: in content, in packages, in available methods of watching…the works. It may be okay for the simplest of TV watchers, but for anyone who has more “advanced” needs from their TV service, YouTube TV just won’t cut it. I know it didn’t for me. I also don’t like the suggestions section of the Home screen. Really, it’s the placement of these suggestions—I don’t want this to be the first thing I see when I open the app. That doesn’t work for me, nor do I think it would for most users. Show my recordings or the live channel guide—not a bunch of animated suggestions that don’t even seem to be tailored to me. Don’t get me wrong, I realize the value in suggestions. Netflix does it, and it does a good job of it. YouTube as a service actually nails the suggestion thing for me most of the time. Google Play Music even does a decent job of showing me new stuff. And on a long enough timeline, I may start to appreciate YouTube TV’s suggestions more (if it gets good about using data on what I’ve watched). But right now, the organization and presentation of YouTube TV leaves a lot to be desired. So, Can YouTube TV Replace Your Cable Service? I’m sure you already know the answer here, but I’m going with no. I mean, I’m sure it can for some people, but not most. And for $35 a month, you’re better off going with something like Sling—it’s a lot more robust, offers apps across basically every platform, and has a cleaner, more intuitive interface.